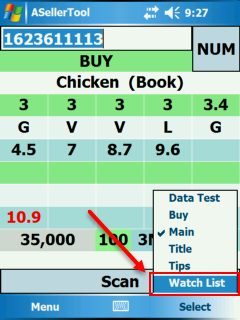 The Watch List section allows you to add ISBNs that would when scanned normally come up as a ‘BUY’ or as a ‘REJECT’ will instead come up as ‘WATCH LIST’. Top Text Box: Either the PDA’s virtual keyboard, or the scanner connected to the PDA can be used. The scanner should automatically add scanned barcodes to the Watch List, while manually entering them using the virtual keyboard will require you to press the ‘Enter’ key, or using the ‘Add New Watch’ option in the Watch List’s Menu. My Watch List: This list contains all the barcodes that you current have added to the Watch List. They can be selected by taping on them. Add New Watch: Tapping this button with a barcode entered into the Top Text Box will add that barcode to the ‘My Watch List’ section. 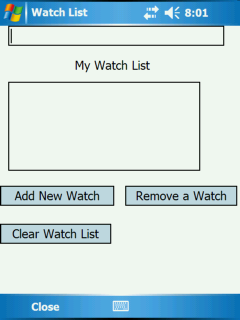 As of now, you can only add one item at a time to the watch list. Remove a Watch: Tapping this button with a barcode selected on the ‘My Watch List’ section will remove that item from the Watch List itself. Clear Watch List: Tapping this button will bring up a warning dialog box asking if you would like to clear your whole Watch List. Tapping ‘No’ will return you to the intact Watch List. Tapping ‘Yes’ will return you to a cleared ‘Watch List’ section. Close: This button on the bottom right hand side will close the Watch List section, and bring you back to the main ASellerTool screen. !The ‘Enable Watch List’ checkbox must be checked and saved on the Program Setting screen in order for the ‘Watch List’ result to come up. If this is not checked, the Watch List will be set, but items on the Watch List will come up with the standard ‘BUY’ or ‘REJECT’ rating.